Pershing II intermediate range ballistic missiles. You’ll see what we’re getting at shortly, but the thing to keep in mind is that Moscow, the capital of Russia (and before that, the Soviet Union), is in Europe. And by virtue of that, it’s thousands of miles closer to NATO and NATO weapons than Washington, D.C., would ever be to Russian weapons. In the late 1970s, the Soviet Union introduced a new generation of intermediate range missile. The RSD-10 ballistic missile, known in the West as the SS-20 “Sabre,” was a nuclear-tipped missile with a range of up to 3,106 miles and the ability to carry up to three nuclear warheads. Although the SS-20 didn’t have the range to strike the continental United States or Canada it could hit virtually all of the European NATO nations. In response the U.S. and NATO fielded two intermediate-range weapons of their own: the Gryphon ground launched cruise missile (actually, a land-based version of the Tomahawk cruise missile), and the Pershing II ballistic missile. The deployment of the American missiles created an unforeseen problem for the USSR: while American intercontinental and submarine launched nuclear missiles might take the better part of an hour or more to reach the Soviet Union the Pershing II missile, launched from NATO bases, would take only 6 to 8 minutes to reach Moscow. This gave the NATO the theoretical ability to launch a surprise nuclear attack that could wipe out the Soviet Union’s leadership before it had a chance to order a counterstrike. The SS-20 deployment had backfired on Moscow, making it less secure than before. The treaty banned ballistic missiles from 310 miles to 3,420 miles, and with a few strokes of a pen Gryphon, Pershing II, SS-20 and hundreds of other missiles were all headed for the scrap heap. There were plenty of exceptions. The treaty didn’t ban nuclear weapons, just their delivery systems. Short-range missiles under 310 miles were A-OK, and intercontinental ballistic missiles threatening the U.S. homeland were still legal. And if the U.S. or U.S.S.R. could have as many aircraft and ship-based missiles as they wanted—even within the banned range. SS-20 transporter erector and launcher. Still, European capitals that were targets for the missiles—Moscow included—breathed a sigh of relief. Although the treaty kept ICBMs in place, even Washington had something to smile about—in the event of war the use of the banned missiles could have helped escalate a regional nuclear war into a global one. The INF Treaty had removed a link in the chain of nuclear escalation. The treaty banned both conventional and nuclear-tipped missiles to prevent one country from pulling an atomic switcheroo. Under the terms of the treaty both sides began dismantling missiles, with the Soviet Union destroying 1,846 and the U.S. 846 missiles. After the collapse of the USSR in 1991 the ex-Soviet republics continued to abide by the treaty, though only one of them, Russia, retained nuclear weapons. For decades, the treaty held. Both sides agreed the other was in compliance and there was no cheating. The U.S. withheld key details, not naming the missile or explaining how it it constituted a violation. Internally, the Obama Administration reportedly wrestled with how to respond. In November 2018 the U.S. finally showed its cards. According to U.S. Director of National Intelligence Dan Coats, the intelligence community believed Russia began development of the 9M729 likely sometime in the 2000s and had completed testing by 2015. “Russia initially flight tested the 9M729 – a ground based missile – to distances well over 500 kilometers (km) from a fixed launcher. Russia then tested the same missile at ranges below 500km from a mobile launcher,” Coats explained back in November. “By putting the two types of tests together Russia was able to develop a missile that flies to the intermediate ranges prohibited by the INF Treaty and launches from a ground-mobile platform,” he said. Coats stated that this parallel development of seemingly two different missiles was actually cover for the development of one long range, treaty busting missile. The 9M729 missile, in the launch canister. Moscow declined to show the missile directly. Russia, for its part, denied the allegation. In late January 2019 Moscow held a press conference in which it acknowledged 9M729 existed but said it did not violate the INF Treaty’s range limitations. In fact, Moscow claimed, it actually had a shorter range than the (treaty-complying) missile it was based on. Russia showed off the missile canister and launcher, but would not show off the actual missile. The U.S. replied that it required more proof to verify the missile’s range. Meanwhile, Russia made counter-accusations. Russia claimed that Mk. 41 armored missile silos deployed in Deveselu, Romania as part of a U.S. ballistic missile shield, were an INF violation. Developed to carry all sorts of missiles for U.S. Navy cruisers and destroyers, Mk. 41s in Romania held SM-3 ballistic missile interceptors. Russia charged that those same launchers, conveniently located in a country bordering Russia itself, could easily be filled with Tomahawk cruise missiles. Russia also charged that some armed U.S. military drones fell under the INF Treaty and were also a violation. On February 2nd, 2019, the United States officially took steps to withdraw from the INF Treaty. Unless both sides decide to keep the treaty, it expires in just under six months. So. Where are we now? The U.S. government has been in fairly broad bipartisan consensus across two very different presidential administrations that the Russian missile constitutes a treaty violation, and deteriorating relations between the two countries make it unlikely the U.S. will back down. Allegations of Russian meddling and influence in U.S. domestic affairs, including elections, will probably only harden Washington’s position. Moscow clearly wants the treaty to remain in force, but if you believe two successive presidential administrations, one Democratic and one Republican, it has built treaty violating weapons and intends to keep them. If the treaty goes away Moscow could again face U.S. missiles again in Western Europe, and the old worry of a sudden, decapitating nuclear strike orchestrated by Washington returns. Russia itself has the most to lose from the end of the INF Treaty, but so far its defense of the 9M729 has been a barrage of counter-accusations and unconvincing press conferences. The Russian government would face a major loss of credibility if it admitted the missiles—of which there are already reportedly nearly 100 operational—violate the treaty. Chinese DF-26 ballistic missiles, reportedly with the range to hit the American territory of Guam in the Pacific Ocean. It’s been more than 30 years since the signing of the treaty, and the world is more complex than during the Cold War. Since the early 1990s China has built up an arsenal of hundreds of ballistic missiles with both conventional and nuclear warheads as a means to strike targets at long ranges. As China was not a signatory of the INF Treaty, that was certainly within Beijing’s right. These missiles can easily target U.S. allies in Asia and U.S. bases across the Asia-Pacific. 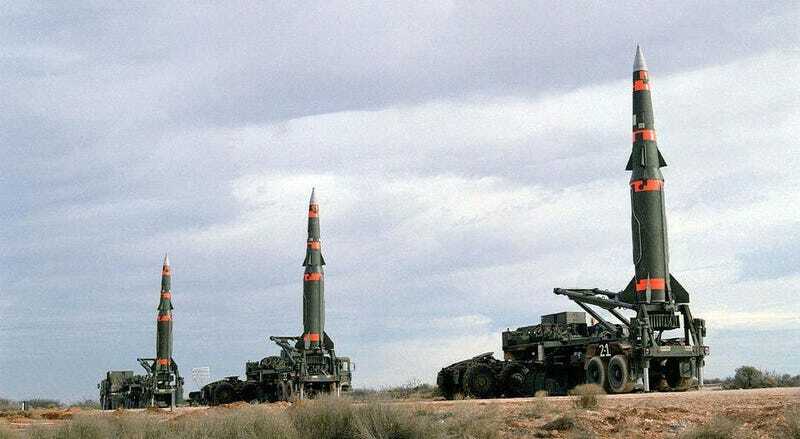 Observers in the U.S. have noted that with the demise of the treaty, the U.S. would be able to build a land-based missile arsenal of its own, hosting them abroad or on American territory in places such as Guam and Alaska. Outside the two major parties, reaction is mixed. The NATO nations clearly do not want a return to the world of 1986, with missiles on both sides, but are also unanimously standing by Washington’s assertion of a treaty violation. The Chinese government is no doubt unhappy with the Russians for placing the INF Treaty in jeopardy, as they could soon face an American missile buildup of their own. So far, Beijing is only saying it thinks both countries should remain in the treaty. The collapse of the INF Treaty would also mean that Ukraine, the victim of an on-again, off-again undeclared war instigated by Russia, could again produce missiles that could threaten much of Russia. A F-16 fighter releasing a JASSM-ER missile during tests. A land-based version of JASSM-ER would be prohibited under the INF Treaty. JASSM-XR has an even greater range. Could the U.S. build its own land-based missiles? Most definitely. A new stealthy cruise missile, the Joint Air to Surface Standoff Missile—Extreme Range (JASSM-XR) is under development with a range of more than 1,000 miles. Fitting aJASSM-XR with a nuclear warhead and developing a land-based launcher would not be difficult. There’s also the seemingly immortal Tomahawk missile, still around and kicking, that could provide the basis for a Gryphon 2.0. Is there anything to be done to save the treaty? At this point, barring a major climbdown by Moscow or Washington, it seems unlikely the INF Treaty will survive. If it dies, we could see the reintroduction of hundreds of nuclear weapons and the link in the chain of escalation from battlefield to all-out nuclear warfare—precisely as relations between Washington and Moscow are at their lowest point in decades. This is just an example of the brinksmanship often on display in the Cold War and barring a turnaround, something we may have to get used to all over again.